UU’s Deion Tubbs (pictured) pinch-ran in Sunday’s second game against UVa-Wise. 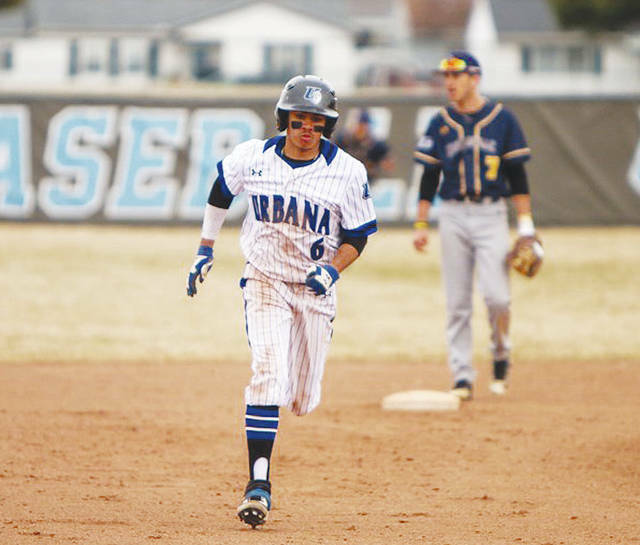 WISE, Va. – Urbana University grabbed the first lead in both games of Sunday’s baseball doubleheader, but couldn’t hang on in a pair of losses to UVa-Wise, 4-1 and 4-2. UU dropped to 2-16 overall and 0-8 in the MEC while Wise improved to 13-12, 7-1 after winning its seventh in a row. Six of UU’s previous eight games have been decided by two runs or less (1-5). UU outhit Wise 10-6 but couldn’t come through in the clutch. The Blue Knights stranded 10 runners, including two in the second, fourth, sixth and seventh frames. Freshman Briley Harlan’s two-out single up the middle put UU ahead 1-0 as freshman Justin Donovan came around to score. However, Wise countered with four runs in the third with a go-ahead three-run homer from center fielder Brett Yates. UU freshman Logan Fisher pitched into the fifth inning and recorded three strikeouts. Four of the six hits allowed came in the third inning as the right-hander dropped to 0-3. UU reliever Ryan Townsend didn’t allow hit over the final one-and-two thirds. Taylor Lane, Tyler Dellerman, Brett Bell and Harlan each had two hits to lead the Blue Knights. Wise’s RJ Vanvickle (3-2) earned the win on the mound after going 5.1 innings and giving up the one run on nine hits. Chase Carney and Robbie Guerrero III homered on back-to-back pitches in the first inning. However, that was all the offense UU could get going in the nightcap. After getting a run back in the third, Wise plated three unearned runs in the fifth following three Blue Knight errors. Guerrero was tagged with the loss after taking over for Hunter Cohee in the fifth. In his second start, the freshman Cohee surrendered just three hits but labored through four innings. UU left the bases loaded in the fifth and two runners on in the sixth. Both teams had six hits as six different Blue Knights recorded a base knock. UU pitchers did not allow an extra-base hit in the second game. UU travels to Miami-Hamilton for a non-conference game Thursday afternoon with first pitch set for 4 p.m. at Foundation Field. https://www.urbanacitizen.com/wp-content/uploads/sites/36/2019/03/web1_uubaseball.jpgUU’s Deion Tubbs (pictured) pinch-ran in Sunday’s second game against UVa-Wise.